MADISON—On Nov. 19, over 25,000 people rallied at the Wisconsin State Capitol to kick off the electoral drive to recall Gov. Scott Walker and Lt. Gov. Rebecca Kleefish. Petitioners began collecting signatures on Nov. 15 for a special election in the spring of 2012. To hold the election, 540,000 valid signatures of “electors” (those not currently in prison or on parole who are state residents eligible to vote) are needed; 105,000 had been gathered as of Nov. 18. A much smaller “Jobs Not Cuts” rally of 150 was held early in the day outside the offices of Wisconsin Manufacturers and Commerce, the mouthpiece of the state’s big bourgeoisie, to protest Congressional spending cuts directed at working people. The rally was sponsored by a coalition of left groups including socialist organizations, unions, and Wisconsin Wave. Among the rally speakers, a U. Wisconsin-Madison student highlighted the plight of young workers facing “indentured servitude” to pay off college debts, and a Vietnam veteran told the crowd that spending on U.S. imperialist wars should be brought home along with all troops and contractors in Iraq and Afghanistan. At noon, the group marched to the Capitol to join the Recall rally. Unions mobilized their members to participate in the Recall rally, which was put together by One Wisconsin Now, a Democratic Party front group. The clear emphasis was on funneling the anger and resentment felt by working people into the electoral arena via the recall effort. The statewide rebellion last spring against the notorious Act 10, the law that stripped public workers here of their right to collectively bargain with government institutions, made international headlines and helped inspire the ongoing Occupy Wall Street movement. The specter of over 100,000 people marching against the dictates of the ruling rich in a mid-sized, Midwestern city such as Madison had not been seen since the great labor upsurges of the early 20th century. But the boisterous protest and occupation that shook the Capitol from February to April somewhat quieted after the ultimate passage of Act 10, and was also sabotaged by the state union brass discouraging their rank-and-file members from calling strikes to halt the law. On the local level, the South Central Federation of Labor, the federation of AFL-CIO unions in southern Wisconsin, passed a resolution endorsing a general strike—an act which was never carried out. Over the summer, a series of recall elections of state Senators took place, which resulted in the replacement of two Republicans with Democrats and the retention of the Republican majority. The amount of money spent on the campaigns blew away all previous records, and there was little mention of collective bargaining in campaign ads despite it being the issue that sparked them. The governor recall, if it happens, promises to look much the same. Fundraising has already started, for which there are no limits. This is the bourgeois elections’ “control valve” for popular anger at capitalism acting as intended. Meanwhile, the Wall Street Occupations that have given wings to the resistance elsewhere have only materialized in a minor way here. Occupy Madison camps on an abandoned car dealership lot eight blocks from the Capitol. Roughly 20 people attend its General Assemblies, which are held three nights a week, and occupied in part with fending off ridiculous demands by the city’s Health Department. Participants have held a number of small but spirited protests at banks and other capitalist institutions, and have gotten voiced support from local unions. Despite pockets of radical activism, the political energy in Wisconsin at present is clearly directed toward the recall. Workers are looking to take out their justified resentment on the present administration. But attacks on the working class have come equally from Republicans and Democrats, as demonstrated by cuts to welfare programs, Social Security, and Medicare promulgated by the Obama administration and Democratic-controlled state governments around the U.S. It is no matter if one loyal servant of capital is recalled so long as he or she is replaced with another who is equally loyal to either major party. Socialist Action supports recalling all anti-worker politicians and bureaucrats belonging to any political party—in fact, recalling the entire government of, by, and for the bourgeoisie. We need to start by building a real Labor Party to run working-class candidates who will fight for us! 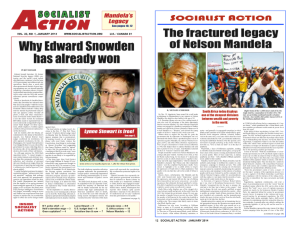 > The article above was written by Carl Sack, and first appeared in the December 2011 printed edition of Socialist Action newspaper.